Get a light-hearted chuckle from the lawyer in your group of family and friends when you present this fun flask gift! It's stainless steel, finished in black metallic, and has a leakproof captive screw-on lid. On the front are the Scales of Justice in silver, with the humorous caption below that says "Trust Me..I'm a Lawyer". 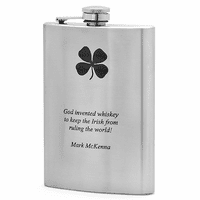 The flask holds 8 oz. 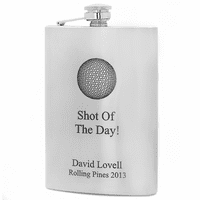 of a favorite beverage, and can be personalized with up to 3 lines of custom laser-engraving at no extra charge! 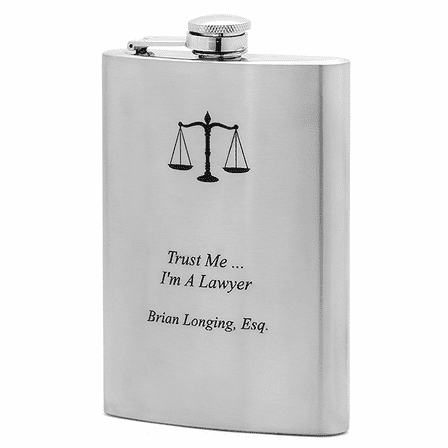 Humorous caption "Trust Me...I'm a Lawyer"
Dimensions: 5 1/2" x 3 7/8" x 7/8"
We guarantee that you or the person you're buying a gift for will be completely, unconditionally thrilled with your purchase. If not, we'll replace it free of charge, even if it's personalized. 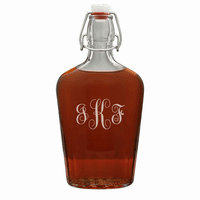 What is the shipping cost on the flask? Our standard shipping, which is first class mail, costs $2.50 for orders under $25 and is free for orders over $25. The shipping time is anywhere from 3 to 5 business days. We also over Priority Mail shipping for $6 and we offer a whole range of UPS shipping methods. You can find the cost for these shipping methods in our shopping cart by entering your zip code.